Sergio Garcia won the 2002 Mercedes Championships, but 16 majors have come and gone since and the Spaniard has yet to break through. KAPALUA, Maui » Sergio Garcia exited the scorer's tent and headed straight to the ropes where a horde of adoring fans leaned in to get an autograph from one of the more popular players in professional golf. Adorned in a black shirt, sherbet orange pants, shoes that looked better suited for a soccer field and a hat hiding a thatch of long hair, Garcia spent a good 5 minutes giving the Mercedes Championships fans what they wanted. He had just completed a 2-under 71 round that left him only two shots off the pace and was in a good mood as he prepares for the 2006 PGA Tour season. Four years ago as a 22-year-old, the Spaniard came away with an exciting playoff win here over David Toms, leaving many to wonder what he would do for an encore the rest of the campaign. He didn't win again on the PGA Tour, but did take home two international events as he solidified himself as one of the game's rising stars. 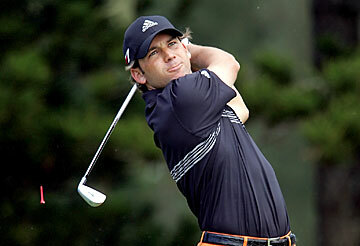 On Monday, Garcia celebrates his 26th birthday, no closer to winning a major championship than he was in 2002. He was asked in the media room yesterday if it bothered him to be questioned how 16 major titles have come and gone since he won here, without his name on a trophy. And instead of getting testy as Phil Mickelson often did when asked a similar question before he finally won a major, Garcia answered in breezy fashion, "No, it doesn't really bother me. "I've always said it. I just try to take the positive out of the question. If I was 40 or 45, it would bother me -- not because of you asking me, but because of me not having been able to win a major more than anything. No, it doesn't bother me at all." You get the feeling that Garcia might not have to answer that question should he return to the Mercedes Championships in 2007. This year, the PGA Championship returns to Medinah Country Club, where Garcia burst on the scene in 1999 as the youngest first-round leader since the event went to stroke play in 1958. It's hard to forget how excited the 19-year-old was after he hit a shot from the base of a tree with his eyes closed, then ran down the fairway to watch the recovery shot that left eventual winner Tiger Woods shaking his head in wonder. The U.S. Open is at Winged Foot this year, another venue that suits Garcia's game as he tries to realize the potential that has trailed after him like an old golf bag on a pull cart. If it's starting to weigh him down, he doesn't show it. Yesterday, despite continually adjusting to the gusty breezes and the new-and-improved greens on the par-73 Plantation Course, Garcia found himself tied for third behind Olin Browne and Vijay Singh. He was pleased with his position and that he was able to finish under par for his first round of the year. "Yes, it was definitely windy," Garcia said. "It wasn't easy, by all means. But pretty happy about it. The greens were tough, but they're rolling very nicely. So it's definitely a good test. "I started bad early. Made a weak three-putt at the first. From then on, I kind of focused a little bit more, got some nice consistency on my putts." It's no secret that ball-striking has treated Garcia with kindness, but the flat stick has left him in a lurch. He spent the better part of last year and all of this one trying to regain his touch. If he does, a stellar season awaits. "It's a slow process," Garcia said. "You can't go from struggling, having trouble holing putts, to making everything just like that. If I keep making good putts here and there, feeling confident, consistent over the ball, it's going to be important." Garcia spent the first 14 holes yesterday either 1 over or even, before carding back-to-back birdies on Nos. 15 and 16. After driving the ball 402 yards on the par-5 18th, his third shot in front of the green rolled a good 12 feet by the hole as he settled for par. Blame it on the new design. "Some of those putts that used to be quick, but not that quick, now they're really quick," Garcia said, when asked about some of the changes on the Plantation Course. "For example, 18, that third shot into that back pin like we had today, I remember you couldn't get it to the pin in the past years. "Today, for example, if you're in the middle of the fairway, you have to hit a perfect shot, kind of leave it on the top, it kind of runs all the way down to the hole. That's something that never happened here. There's a couple of things you're going to get as the week goes on, as you play it more and more." And you get the feeling that if he does, he could be exiting the scorer's tent in an even better mood come Sunday.